Edgy animation memorializes Studs Terkel’s interview with the great Hunter S. Thompson. Few figures rank above Studs Terkel and Hunter S. Thompson in the pantheon of American journalism greats. So what, exactly, could be better than Terkel interviewing Thompson? Oh, that’s right: Terkel interviewing Thompson about his time studying the Hells Angels. Terkel conducted a radio interview with Thompson in 1967, as Thompson was poised to take off as a superstar of gonzo journalism. He had just written Hell’s Angels: A Strange and Terrible Saga, a book that stemmed from a breakout article he’d contributed to The Nation magazine. Though he ruefully recalls falling victim to “bylaw number 10 or 11 […] ‘When an Angel punches a non-Angel all other Angels will participate'” — apparently he once made the fatal mistake of giving a member a hard time for beating his wife — Thompson even sees himself in the frustrated bikers. He confesses to a tendency toward throwing “beer bottles into bar mirrors” and admits enjoying the visceral rush he found in speeding down the highway on a powerful motorcycle. 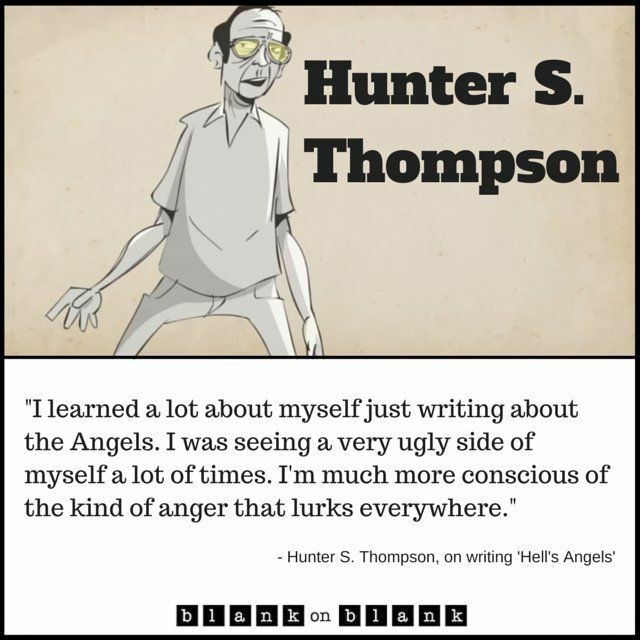 In the mid-Sixties, gonzo journalist Hunter S. Thompson spent about a year with the world’s most notorious biker gang to write the book Hell’s Angels, which came out in 1967. He spoke with radio broadcaster Studs Terkel that year for an interview that PBS has now animated whimsically for its Blank on Blank series. The year Hell’s Angels hit bookstore shelves, the first issue of Rolling Stone also came out. Thompson would go on to become one of the magazine’s most venerated contributors, penning “Fear and Loathing in Las Vegas,” and covering everything from the Nixon-McGovern presidential campaigns in 1972 to Bill Clinton 20 years later for the magazine. He died of a self-inflicted gunshot wound in 2005. An online archive of his Rolling Stone writing is available here. Blank on Blank animates archival interviews with musicians, actors and other notable people. Recent installments have included Joni Mitchell, Michael Jackson, John Lennon and Yoko Ono, Tupac Shakur and Jim Morrison.